Join Sherlock Holmes and Watson as they battle Lord Blackwood in the new 30-payline video slot Sherlock Holmes The Hunt for Blackwood! Join Sherlock Holmes and Watson on a sleuthing adventure as they battle Lord Blackwood in the new 30-payline video slot Sherlock Holmes The Hunt for Blackwood! This awesome new game is based on the 2009 blockbuster film Sherlock Holmes starring Robert Downey Jr. and Jude Law. In fact, IGT has full licensing rights so you’ll even see the faces of these stars on the reels as you’re spinning them. Everything about this game exudes Hollywood. There is the star-studded cast represented as symbols on the reels and you’ll even hear their voices at different periods in play. What really puts the icing on the cake for this game are the enormous amount of bonus features that help you to hit big rewards. Mystery Multiplier Feature – During any spin in the base game, a multiplier can mysteriously appear to multiply your win by up to 10x! Teamwork Feature – On any spin in the base game, all Holmes and Watson symbols can transform to combined Holmes and Watson symbols! Picker Puzzle – Three Bonus Symbols anywhere on reels 1, 3 and 5 trigger the Picker Puzzle. Select from objects in Sherlock’s room to reveal cash prizes or clues that can lead to a bonus. You’ll begin with 5 picks. Blackwood Wheel Bonus – In this bonus you’ll get to spin the wheel to win rewards. Outlast Blackwood for 10 spins on the reels. When a pointer lands on a Blackwood wedge, that pointer is deactivated. When an active pointer lands on a Sherlock wedge, all pointers are reactivated and the Sherlock prices for that wheel is won! The Hunt Bonus – Win 10 or 15 Free Spins in the Hunt Bonus! Locked Wilds appear here in the free spins. 5 locations are circled on the reel map, marking the scenes of the Blackwood’s crimes. 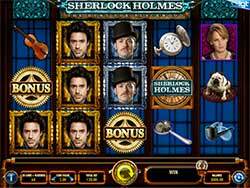 If a Holmes or Watson symbol lands on any of these locations, that symbol becomes a Locked Wild and remains in that location for the remaining free spins. There is also a Bonus Doubler in this round so if Holmes or Watson lock on all 5 crime scene locations, the total bonus win at the end of the spins, including any win from the initiating picker puzzle is doubled!